Sorry for late update because I am busy to select good stocks for my new research reports and also give my time for edit Hindi Edition of my book. I scan 100-200 companies data then I find only 1 stock which full- fill all of my criteria so this is a very time consuming job. plus I get many comments and e mails from my followers so most of my time consume in reply of these comments and e mail. Now we continue this journey. Why Chandu not book this profit 936.32:- Chandu is my strict follower and not book his profit where holding period is below 1 year because after 1 year profits are tax free and one year is sufficient time to evaluate company performance. Chandu do not worried to see this unrealized loss in above 3 stocks because he knew that this loss was notional loss and notional loss is not a real loss until he sell his stocks. 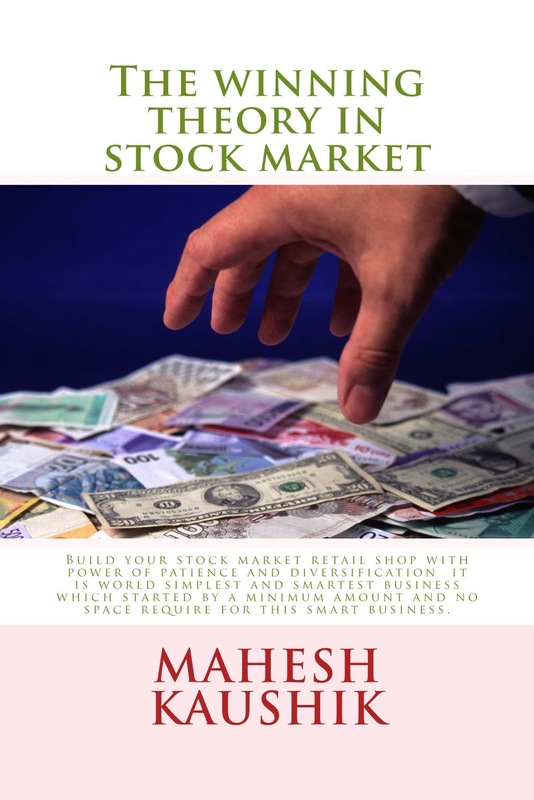 Chandu knew that as per mahesh kaushik theory if price of these stocks is down till zero then his maximum loss is INR 5000 in each stock but his growth potential is unlimited if he hold these stock. Now one day Chandu meet from his childhood friend Chinki, Chinki say " hi chandu how are you? I see you are very happy today? Chandu say " Yes chinki I am happy because I find a very smart business of stock market. Chandu tell his story to chinki then chinki ask one question " Why you invest INR 5000 in a stock ? I have no enough money then how I define a minimum amount for investment in a single stock? Chandu say " Chinki I told you Mahesh kaushik formula of minimum amount investing in stock market. suppose your monthly net income INR 50,000 then 10%=INR 5000 ( which i use in chandu example or in my case). If you earn INR 20000 in a month then this amount is INR 2000 ( 10% of 20000). Suppose your income is INR 30,000 per month and you decide to save INR 3000 per month then do not invest more then 3000 in a single stock. Suppose you start your investment on 01.01.2016 with INR 9000 then you invest INR 3000 in Bank of Maharashatra in Chandu style and hold INR 6000 in cash for my next recommendations. and every time invest your 3000 in a fresh stock do not average out your falling stocks. In above example Chandu invest his 5000 in Pricol Ltd as a fresh buy he do not average out guj sidhee stock which is fall near 50% from his buying price. Thank you Sir for this novel idea, really appericated. I like it ....Interesting and i am trying this formula from this month. Super article mahesh ji. Very valuable , convincing and attractive. Thanks so much for all support. Oh, This is an Imported book so Amazon automatic cancel the orders if shipping time is too late, please re order and talk with amazon customer care and tell him that you wish to wait long if shipping is late so they do not automatic cancel your order. After publishing Hindi version of my book I am also plan to direct selling this book, You may also buy it from flipkart. I respect you for your work. Thank you. I have become a regular reader of your blogs. Soon will start investing like Chandu. My warm redards to you. Great work maheshji.i am also starting to invest in your style.i have a doubt.when same shares are listed on both bse and nse and price is also same from which exchange i should buy.does it make any difference? No difference you can buy from any exchange. very systematic approach..indeed very good grasping for starters like me..keep the good work going sir. Thank you anil sir ji, next part is ongoing and will be publish on Saturday..
this book is available in epub mobi lrf pdb html or on-line reader formate. epub mobi lrf pdb html require special software like kindle book reader or ebook reder epub reader in your system so please install appropriate software or tell me your formate then I provide a link for install free e book reader in your system or use online reader option to read without any software, hope it resolve..if not please contact again with more details.